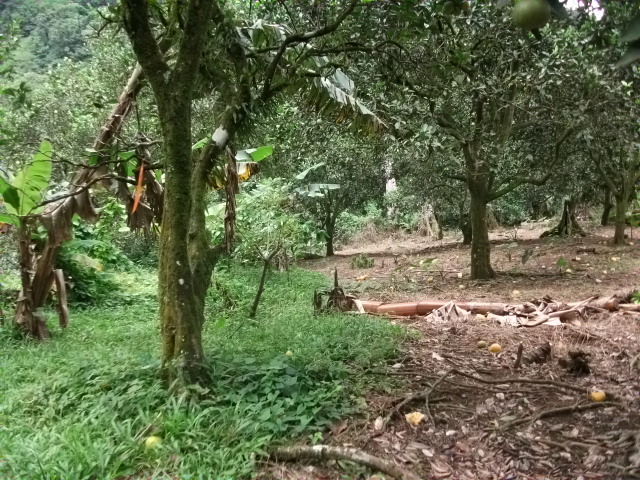 On the left an organic farm whose main crop is citrus. This farm is shipping to other islands where the demand for organic produce is steadily growing. On the right a citrus farm using pesticides to kill everything at ground level. Considering that those who eat organic have much lower levels of chemical toxins in their body which oranges do you want to eat? Just after the spraying at first you cannot tell the land and plants are soaked in a toxic chemical except for the smell. Then the plants get this dark black tinge; then slowly brown dry deadness appears in spots then overtakes the green. The final effect is ugly and knowing the side effects scary and horrifying. In Canada and around the world the same information was being disseminated and the results have been disastorous. In the past only a few spoke out against this deluge of basically unproven chemicals being poured on our soil; those who did we soon silenced. I spoke to a gentleman in the hospital the other day who felt his relative had been quietly released from his duties as an agricultural officer when he kept saying that these chemicals were not as beneficial as it seemed in the short term. Farmers here are still using these dangerous chemicals many of them as in the case of gramoxone are illegal in other parts of the world. While “catching a ride” all over the island I find that farmers often say “Oh I don’t use those chemicals for the food I eat; just the food I sell!” Don’t ever believe all food here is organic!!!!! Yes Canada; the United States and European countries have banned Gramoxone and many other pesticides they sell to us to use in our front yard instead of cutting the grass. Capitalism at its most dangerous level. If you can make money it is ok to still sell a chemical that is causes sickness and death all over the world; has been proven carcinogenic; in fact the marketing manager was likely applauded for getting rid of a product too dangerous to sell in the country it is made in.